The Roccat Kone Aimo mouse is one of the few products that looks far more impressive in your hands than in air-brushed marketing. What might normally seem an excessive use of RGB has been completely justified in the resulting beauty and, within that substantial shell, Roccat have fitted a rock-solid sensor and plenty of macro functionality to back up the Kone Aimo’s good looks. Want to check out the competition? Here are the best gaming mice of 2018. While this chunky 130g rodent may have had a few too many blocks of cheese, it makes good use of it’s generous ergonomic shape to pack in the Roccat Owl-Eye optical sensor, built-in memory, and a ton of macro functionality. It also features a light braided cable, which doesn’t retain too much shape. Make of that what you will. The Owl-Eye sensor (or PixArt 3361) at the Kone Aimo’s core is built-upon the wildly successful PixArt 3360 sensor that is arguably one of the best 1:1 gaming sensors available. With a ridiculous max DPI of 12,000 and a minimum of 100, the Kone Aimo caters to almost all personal preference – even the extremes. The mouse also features a tiny ARM 32-bit Cortex chip and 512KB of onboard memory for macro storage and execution without delay. 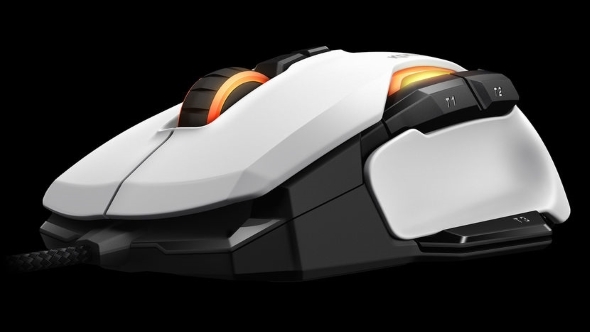 What really makes the Kone Aimo stand out, and I mean really stand out, are the multiple lighting zones that break through the exposed underbelly of the mouse. The AIMO lighting system consistently sways and flickers through the colour spectrum across the mouse in tandem with any other AIMO products you own. At the moment the line-up consists of the Kone Aimo mouse, Khan Aimo headset, and Horde Aimo keyboard. Of course, you are free to mix up the RGBA lighting yourself, and even when the AIMO system is deactivated, the illumination still draws the eye. Within the in-depth, yet sometimes awkward, Roccat Swarm app, you can select from pre-made colour gradients or go entirely custom – though to mixed success in my personal experience. Now, I’m not one to fall head over heels for RGB lighting alone. However, the Kone AIMO’s use of complementary or analogous colours creates a gaming mouse that is visually stunning and perfect for any vanity build. The marketing material is actually quite deceiving, although in no way intentionally. The sheer size of the mouse isn’t really portrayed across most of the marketing, and if you don’t like hefty mice, then look elsewhere. Otherwise, it’s a comfortable fit for gigantic hands and offers plenty of palm support – although only to right-handers. Sorry, lefties. The Kone Aimo comes with eight buttons, including the usual handful of left, right, and middle as you’d certainly expect, but also features two quick DPI switches under the scroll wheel and three thumb buttons – including the Easy-Shift switch. This switch allows the mouse to offer dual functionality for every mouse click or switch, offering way more macro capacity on-the-fly. It’s also a pretty handy location – just under the thumb – for quick-fire shortcuts. While it’s MSRP is a little steep at $80 / £70, you can often find this mouse at a considerable deal less with a quick search – which swiftly mellows any potential doubts over value for money. It certainly feels worthy of its price tag so long as you are willing to stretch your budget for non-essential features. The Roccat Kone Aimo is a pleasure to use on a day-to-day basis. It’s quick, well-built, accurate, and exceptionally pretty. What more do you want? A left-handed version? Um… sorry, but that’s a no-go.